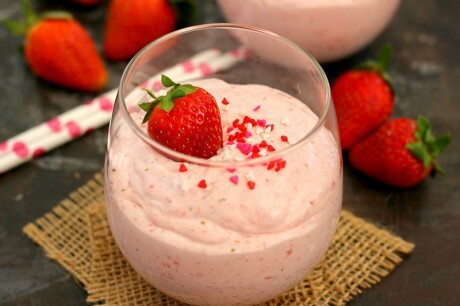 In a blender or food processor, pulse strawberries until almost pureed and small chunks remain. Set aside. In a medium bowl, whip heavy cream with an electric mixer or stand mixer with fitted paddle attachment until stiff peaks form. Set aside. In another medium bowl, beat cream cheese, powdered sugar, and vanilla extract until light and fluffy. 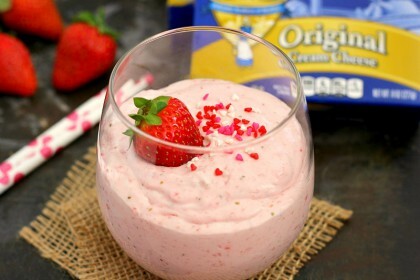 Gently stir strawberries into cream cheese mixture, and then fold in whipped cream. Spoon mixture into 4 bowls or one medium size bowl. Refrigerate for at least 20 minutes, or until set.